Register and join with other Indonesian Christian Writers at this event: Retreat for Writers, November 2-5, 2013 at Guest House YAPKI/OMF, Letjen Suprapto 28, Cempaka Putih, Jakarta Pusat, Indonesia. 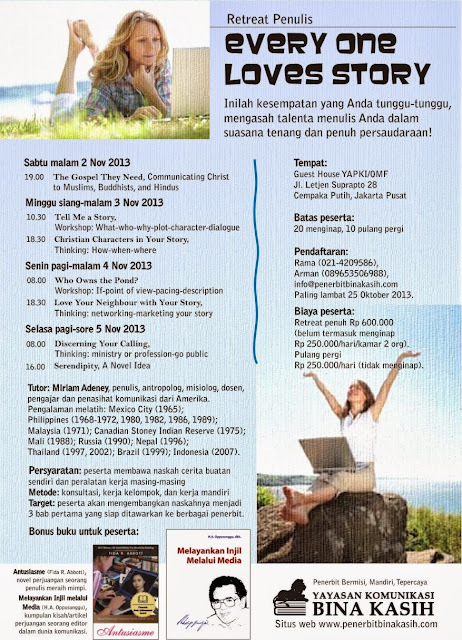 Participants will stay at a quiet place and friendly environment, be taught by a professional speaker and tutor, Miriam Adeney from US, and also get two book gifts: Antusiasme (Enthusiasm in Indonesian version, author: Fida Abbott) and Melayankan Injil Melalui Media (Servicing Bible Through Media, author: H.A. Oppusunggu, founder Komunikasi Bina kasih Foundation, YKBK). Conditions: Participants bring their own manuscripts and writing tools. Method: Consultation, working independently and with group members. Target: Participants will develop their manuscripts to become three first chapters that will be ready to send them to publishers. Participants: Max.20 stay, 10 non-stay. Miriam Adeney is an international speaker, teacher, and writer with a widespread and varied ministry. She has written dozens of articles and books, including A Time for Risking: Priorities for Women and Daughters of Islam: Building Bridges with Muslim Women. She currently holds teaching positions at Seattle Pacific University, Regent College, and Fuller Theological Seminary, and visiting professorships in seminaries all over the world. She also serves as a mentor to Christian writers in Asia and Latin America. 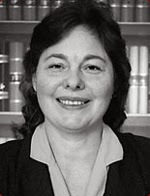 Miriam earned her bachelor’s degree in anthropology from Wheaton College. She also holds a master’s degree in journalism from Syracuse University and a doctorate in anthropology from Washington State University. She serves on boards for several ministry organizations, including Christianity Today Internationaland Christians for Biblical Equality. Miriam is a member of University Presbyterian Church in Seattle, Washington. She is married to Michael Adeney, and is mother to Daniel, Joel, and Michael.